Now that we’ve entered into fall, pumpkins – and decorating them – seems to be on everyone’s mind! Carving the vegetable can be a little messy, however, so how about opting for the paint and paintbrush instead? We’ve actually rounded-up a whopping 65 DIY painted pumpkin tutorials to help you achieve your very own #pumpkingoals this fall. From floral masterpieces, to donuts, cacti, animals, and fruity designs – there’s seriously something here for everyone! If you’re a fan of Kate Spade, then you might just love these DIY painted pumpkins from 204 Park! The assortment of colors are so on-trend. Alisa Burke is one talented artist, so she’s created these DIY painted owl pumpkins as a Halloween inspired treat. Want to give it a crack yourself? Check out the full tutorial! We adore this Frida Kahlo inspired painted pumpkin, along with Alisa Burke’s other Mexican inspired designs. Who wouldn’t want to make these to display this fall? Here’s another gem from Alisa Burke, this time featuring a unique glow-in-the-dark design. Amazing! Fancy creating a fairytale inspired painted pumpkin, complete with gold butterflies? Every little princess will love this design from a Pumpkin and a Princess! Here are two really beautiful designs from Art Actually, and the good news is that they’re both really easy to paint too! What do you get when you combine cacti with pumpkins? These awesome creations from Aww Sam of course! Metallic paint and oozing glitter? We love this DIY pumpkin idea from Bre Pea! This is one feminine and floral pumpkin design from Brit + Co! Although not strictly ‘painted’, this DIY tutorial still requires you to paint on some glue. If you’re in a hurry to create a funky pumpkin in time for Halloween (or fall), then this DIY gold glitter design is quick and easy! Check out the full tutorial from Brit + Co.
Wow, this is such a unique and colorful DIY painted pumpkin idea from Brit + Co! You could even get your kids to help out with this crafty project. Here’s a chic, gold and black DIY painted pumpkin idea from Brit + Co – they sure do love their painted pumpkins, don’t they? We adore this design too. When you paint a pumpkin white, draw some awesome designs, and then add a cute kitten, you’ve got this incredible DIY painted pumpkin idea from Cosmopolitan! Wow, how gorgeous does this painted pumpkin look from Craft Berry Bush? The blogger has even been generous enough to provide a free printable of the design for you! Who knew it could be so easy to create a floral pumpkin masterpiece, just as Craft Berry Bush has done? We love the color scheme! Love all things Tiffany? So does Crafts by Courtney, and that’s why she created this Tiffany inspired painted pumpkin – so glamorous! Here’s a fun DIY painted pumpkin idea that the kids are going to love! Crafty Morning created these pumpkins that look just like Minions. All you need are simple paint splatters to create this eye-catching painted pumpkin design from Design, Dining, and Diapers! They’re perfect for a table centerpiece too. What an interesting DIY painted pumpkin idea from Design Improvised! It’s got a geometric aesthetic which is still very on-trend. Disney Rewards has created their very own pumpkin version of BB-8 from Star Wars! Imagine this on your front doorstep come trick or treat time. Who knew pumpkins could look so pretty? For the Makers certainly did, so she created these gold and pastel versions of the popular fall vegetable. We love them! 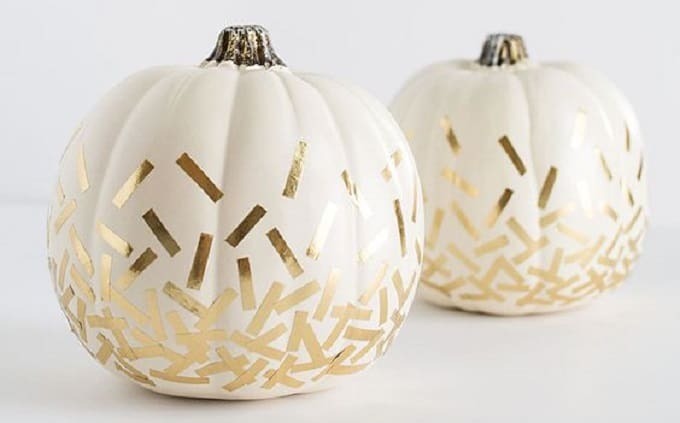 Paint your pumpkin white, add some gold sprinkles, and you’ve got yourself this wonderful DIY version from Homey Oh My! So simple, yet chic. A monochromatic color scheme can also work very well on painted pumpkins – just ask Homey Oh My! The paint splatters also add an arty touch. Want to know what the mud cloth trend is all about? Simply check out these DIY mud cloth painted pumpkins from Homey Oh My to see why it’s trending! What a classic and elegant painted pumpkin idea from Hunted Interior! You’ll want to display this amazing piece of home décor for years to come. What a fun, fall inspired owl pumpkin from I Heart Crafty Things! Those bright colors just pop against the black background. Gold polka dots and curly calligraphy – does it get any better than that? Java Cupcake has created this beautiful design to display in her home. Lia Griffith is the queen of all things felt, and this time she’s combined the material with painted pumpkins to create these fall inspired animal pumpkins! Now that’s clever. Lines Across created these pretty and pastel watercolor pumpkins and we think they look divine! You could even give these as gifts or party favors. White and gold is such a great color combo, don’t you think? Lovely Indeed embraced the two shades for her DIY painted pumpkin project – beautiful! Speaking of white and gold (and the talented Lovely Indeed), here’s another DIY design that’s perfect for fall. Which design do you prefer? Made in a Day hasn’t just painted her pumpkins, she’s also added some metallic confetti for a fun look. This DIY project could take you less than an hour! Copper has become an extremely popular color choice of late, so how about putting some on your own DIY pumpkin, just as Made in a Day has done? It’s classy and cool. You can also turn a pumpkin into a world map, just as Martha Stewart has done! This is one of our favorite DIY versions from her ‘30 Painted Pumpkins in 30 Days’ series. Add some summer sparkle to your DIY painted pumpkin by following this tutorial from Martha Stewart. It’ll teach you how to recreate that amazing citrus slice print. Here’s a more traditional Halloween inspired pumpkin from Martha Stewart, featuring a spooky skeleton face! Well, it’s not too spooky, is it? Celebrate the 80’s, pumpkin style! Here’s another one of Martha Stewart’s 30 painted pumpkins that we fell in love with. Add that extra special Halloween touch by recreating this painted pumpkin from Martha Stewart. She has a step-by-step tutorial for you to follow too. Speaking of Halloween, here’s a cool spider design that’s sure to delight any trick or treater. You’ll love this idea from Martha Stewart! This fall foliage inspired design from Martha Stewart would look stunning in any space of your home! Where will you put yours? Martha Stewart wanted this DIY painted pumpkin to represent stained glass. We think she’s done a fantastic job! Take inspiration from this DIY pumpkin from Mid-West Living! It’s not just painted, but has also been adorned in a fancy string design. Want to learn how to achieve this unique marbled pumpkin look? Thankfully, Mom Dot will show you how through this tutorial! Nakia Nieves’ awesome DIY Ninja Turtles pumpkin idea was shared via Crafty Morning and we adore these genius designs! Pastels and metallic gold – what a stylish combo! Nest of Posies even got her son to help out with this one, that’s how easy it is to recreate. Plaid Online will show you how you can use some of their products to recreate this gorgeous patterned paper design. It’s certainly a vibrant pumpkin! Take inspiration from your favorite Pantone colors when it comes to your next DIY painted pumpkin project, just as Posh Little Designs has done. There’s literally thousands of options! With just some white paint and different styles of tissue paper, you too can make your own DIY pumpkin just like Sarah Hearts’ version! This is something we’d love to display all year. Here’s another marble design, this time featuring the pattern on only parts of the pumpkin. Say Yes will show you how it’s done! Simple as That will teach you how to make not one, but four clever painted pumpkin designs! You could easily knock these over within a weekend. Have you ever seen a pumpkin looking this cool? Studio DIY cleverly turned hers into a stylish pineapple to embrace the summer trend. At least it will still look this fun come fall! Speaking of turning pumpkins into other edible delights, Studio DIY has also turned hers into donuts! This would have to be one of our most favorite DIY painted pumpkin ideas. You can even use precious gold foil on your pumpkins, just as Studio DIY has done. These are so clever – we want one in every color! Studio DIY certainly is one clever crafter – she’s even created a series of pun inspired pumpkins to give you all a kick this Halloween! Fancy making your own hamburger pumpkin? We’d be lying if we said no! Check out the full tutorial from Studio DIY for more info. Here’s another tutorial that will teach you how to paint pumpkins so that they look like totally different foods! Style Me Pretty has painted these ones to appear as summer fruits – so clever! Who knew that white, blue splatters and gold foil could look so classy? Suite One Studio must’ve, and they created this genius of a tutorial in the process! White paint and tissue paper confetti – does it get any simpler than that? Thankfully, this DIY pumpkin from The Crafted Life also looks a million bucks! These tribal inspired painted pumpkins are so clever and we love the way they incorporate trendy patterns and designs. The Crafted Sparrow will teach you everything you need to know to recreate these beauties for yourself! Here’s not one, but two incredible painted pumpkin designs from Funky Time! Which one is your favorite? Personally, we can’t choose! This design might be simple, but doesn’t it pack a punch in the design department? The Merry Thought created a pattern of brush strokes in these glamorous shades. These painted pumpkins from The Proper Blog are as pretty as a picture! Their marble design and feminine color scheme make them absolutely perfect. 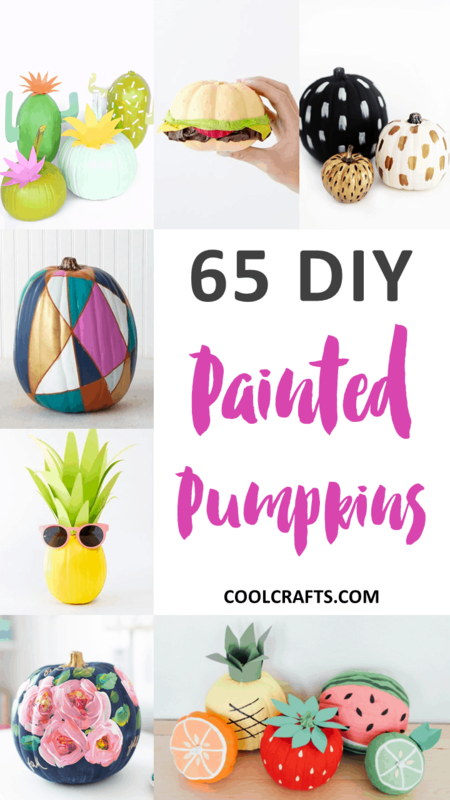 If you’re really lacking in time and materials but truly want to create some spectacular painted pumpkins, then this idea found via The Snug is perfect for you! Simply paint your pumpkins in three gradients of the same color for an ombre effect. The Swell Designer turned her pumpkin into the galaxy – well, sort of! Follow the tutorial to see exactly how she created this work of intergalactic art. Tracy Chou’s quirky ‘ice cream disaster’ painted pumpkin can be found via Martha Stewart’s website. It’s fun and a little humorous too! There you have it – 65 easy DIY painted pumpkins that are perfect for fall! Which designs were your favorites? We’d love to hear from you in the comments section below!